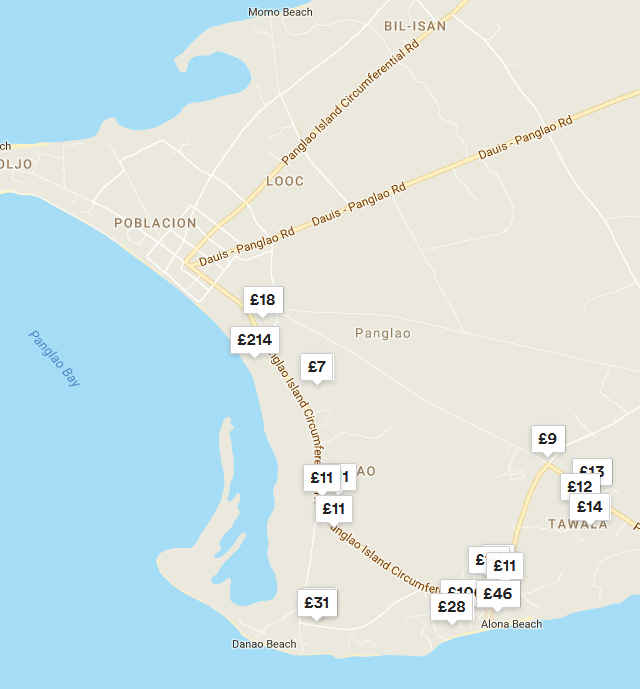 Tsunami vulnerability simple visualization for Booking.com accommodation at Panglao Island made by GIMP software. Coastal zone make up only 4% of the world’s land area but are home to one third of the world’s population. Coastal zone is also the most popular destination for holidaymakers, who stays in the hotel located alongside the beach. Being on your holiday we are not alway aware the basuc and underrated hazard, that is tsunami wave. Tsunamis are caused by the displacement of a large volume of water, generally in an Ocean or a sea. This displacement of water is the outcome of submarine seismic disturbances. Submarine earthquakes have the potential to generate landslides along the steep-continental slopes, that flanks most coastlines (Bryant, 2005). In additions step slopes exist on the sides of ocean trenches and around the thousands ocean volcanoes, seamounts, atolls and guyots on the seabed. Because such events are difficult to detect, submarine landslides are considered a minor cause of tsunami (Bryant, 2014). More often tsunami can have a volcanic origin, especially when the eruption is associated with tectonic earthquakes. In general a volcanic eruption rarely procude a large tsunami. Probably the most devastating event was the Santorini Island eruption around 1470 BC, which generated a tsunami that must have destroyed all coastal towns in the eastern Mediterranean. Another, but very rare reason of tsunami is asteroid impact into the ocean. It has been only one suspected in human history on September 28, 1014 (Bryant 2014) and possibly a few more earlier whilst Chicxulub impact in Mexico, that was responsible for extinction of the dinosaurs. Finally also meteorological events can generate tsunami (Bryant 2014). These tsunami are common in tempere latitudes, where variations in atmospheric pressure over time are greatest. Such phenomena tend to occurs in lakes and embayments where resonance of wave motions is possible (Bryant, 2014). Nowadays we have a lot of tools, that are able to asses the tsunami vulnerability for the coastal zone around the world taking into account the factors like: land cover, land use, slope, elevation, geomorphology, distance from the shore and altitude above the sea floor. From our point of view the most important factors is altitude above mean sea level and degree of tourist infrastructure (places to stay) in the coastal zone. 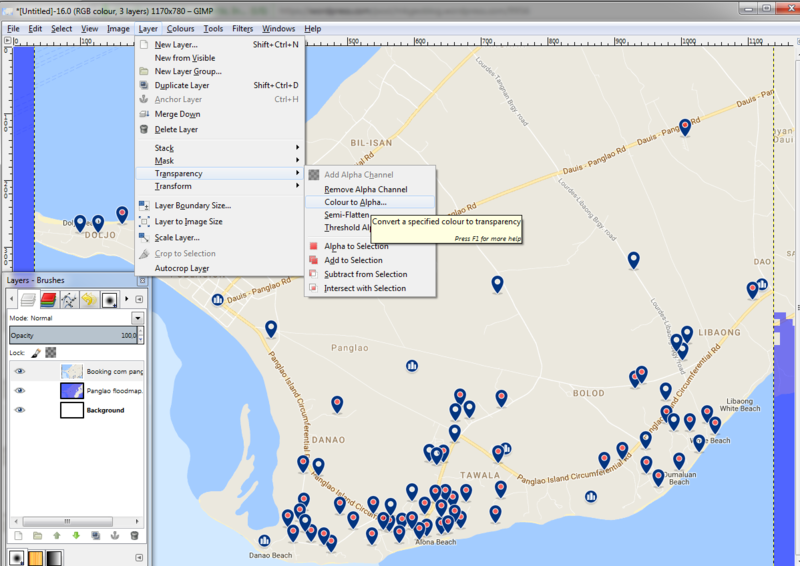 I found the simple way to using very basic GIS tools to evaluate the tsunami impact on your tourist destination. Analyses of tsunami range with respect to altitude above mean sea level are widespread in the web. 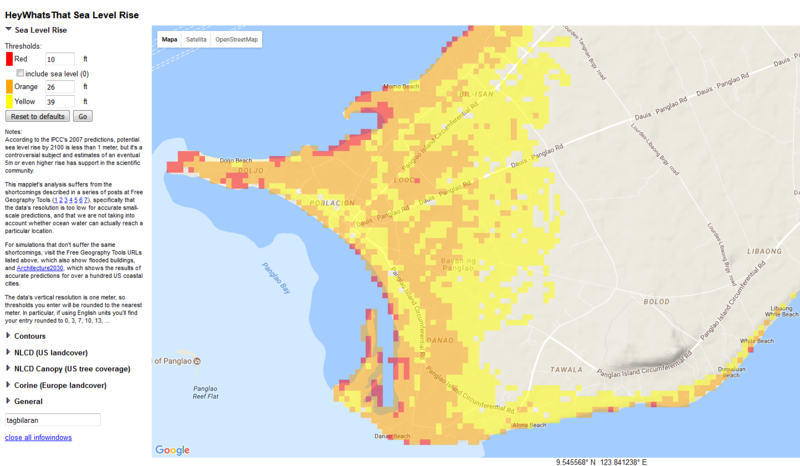 You can use both the Water Level Elevation Map and Tsunami Mapper to imput random value of sea level rise and check the hazard dimension in your area. However if you want to fiddle more with this issue I will show you the simple process how to overlap the increased sea level with all places to stay displaced in your area. 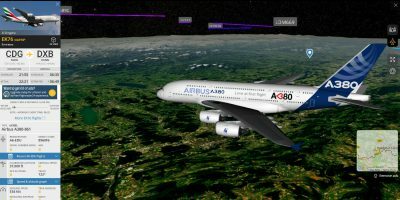 You will need 3 tools: sea level map, GIMP software and Booking.com. Basically I found two, however I am aware, that you can find more. One of them is Floodmap.net server (Pic. 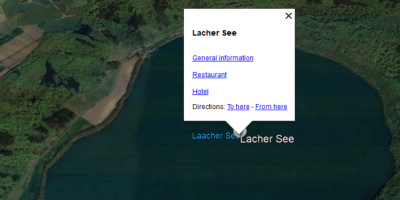 1), where you can check the sea level for each location. I will considerate the Bohol island, where I am going on honeymoon. Pic. 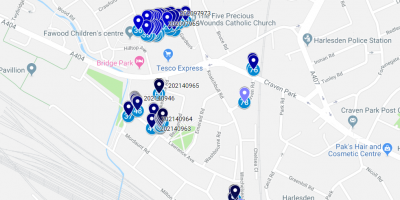 1 The Floodmap.net main interface: 1 – Put your location, 2 – Set the water level (meters above current sea level). This server is nice, although you can only considerate one value. For instance the sea level generator provided by Heywhatsthat.com, is slightly more advanced. It allows you to use 3 values in the result (Pic. 2,3). However it doesn’t reflect a rough sea level rise even if you put the values correctly. Moreover you are not able to change the color values, because otherwise they are gone. 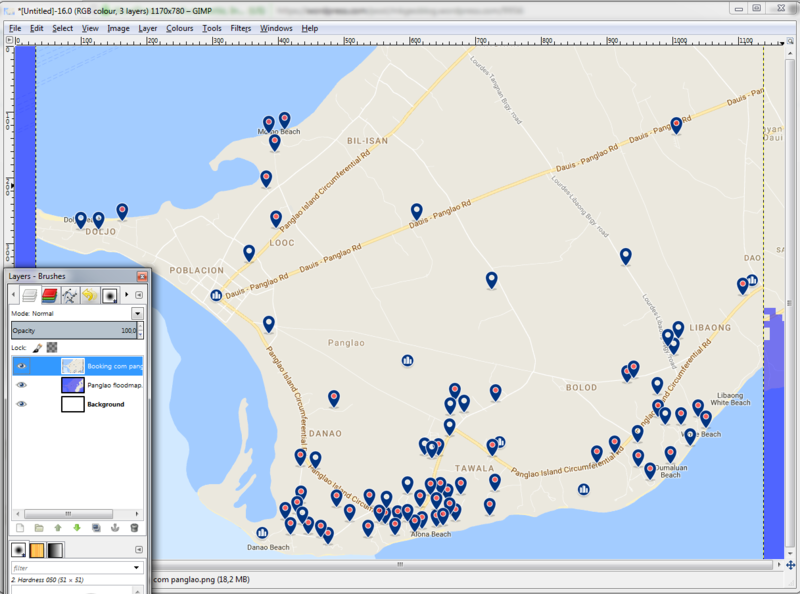 Anyway I will show you below how to use it and next how to combine it with another Google Map layer including the places to stay. Pic. 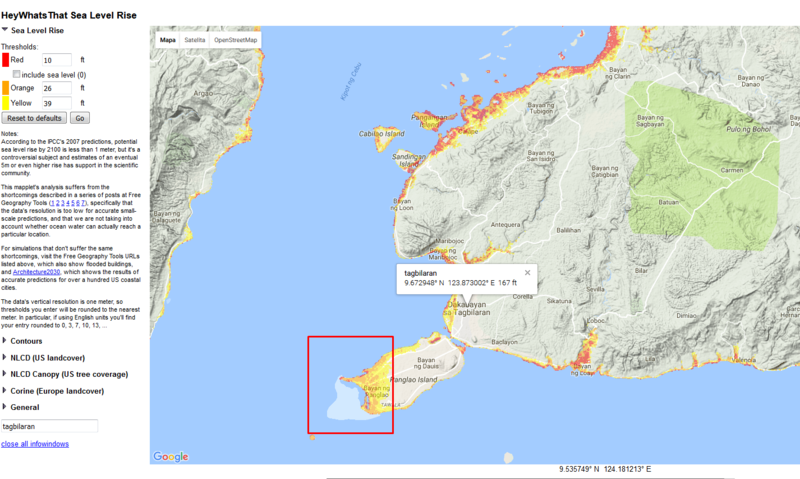 2, 3 The Haywhatsthat.com sea level interface centered on the Bohol Island with description below: 1 – Sea level rise options with 3 variable values, 2 – The location bracket, 3 – The landcover layers available, 4 – “Include sea level” option. At first I am not recommending you to select “Include sea level” option, because your the lowest value will cover all water area includuding additional sea floor rise value (Pic. 4). Pic. 4 The “Include sea level” value switched on – your bottom value actually covers all water area around islands. When you are ready you can zoom in to your tourist destination. See the western part of Panglao Island below (Pic. 5, 6). Panglao Island is connected by 2 bridges with Tagbilaran – the capital of Bohol island. Pic. 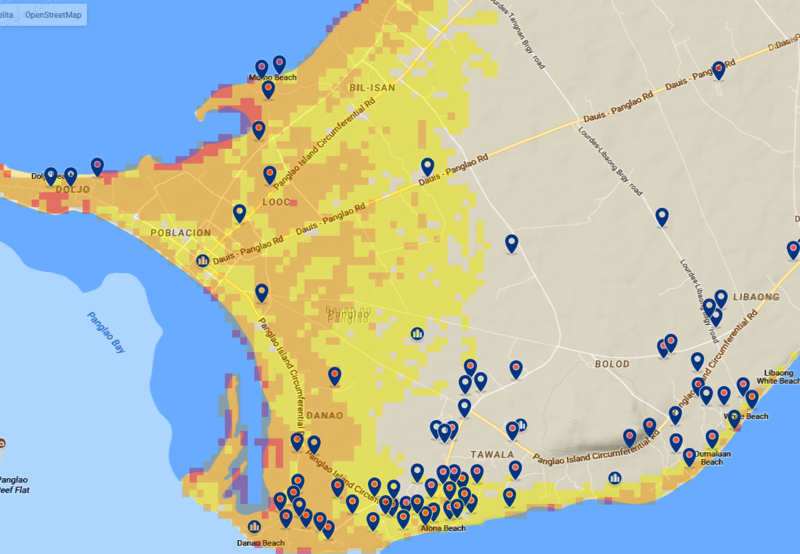 5, 6 The tsunami hazard on Panglao Island (for values: 10m – red, 25m – orange and 39m – yellow). 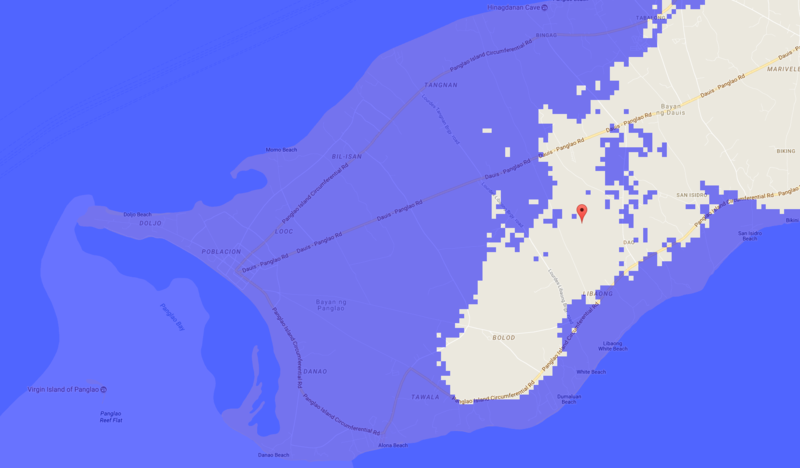 On the contrary to Heywhatsthat.com sea level generator the Floodmap sea water level elevation shows much more inundated area on this island (Pic. 7). Pic. 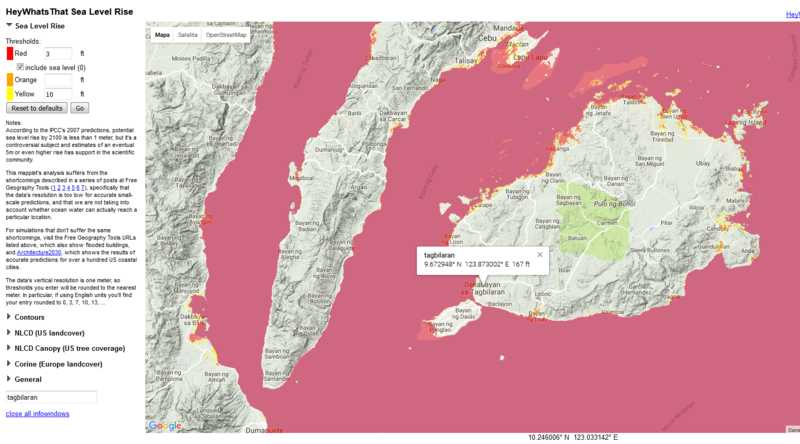 7 The western part of Panglao Island covered by tsunami water when wave altitude is 25m. 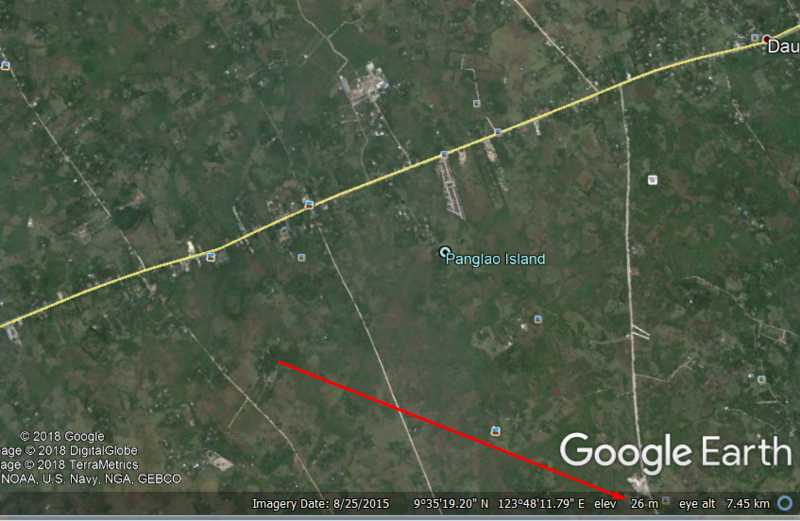 So because of this inconsistency I had to check this thing in Google Earth. At the outcome I came around Heywhatsthat.com sea level generator definitely! I have found, that typical altitude on the Island is around 30m.a.s.l. (Pic. 8). Why it hasn’t been covered in Heywhatsthat.com then? Pic. 8 Typical altitude of Panglao island is around 25-30m.a.s.l. according to Google Earth. 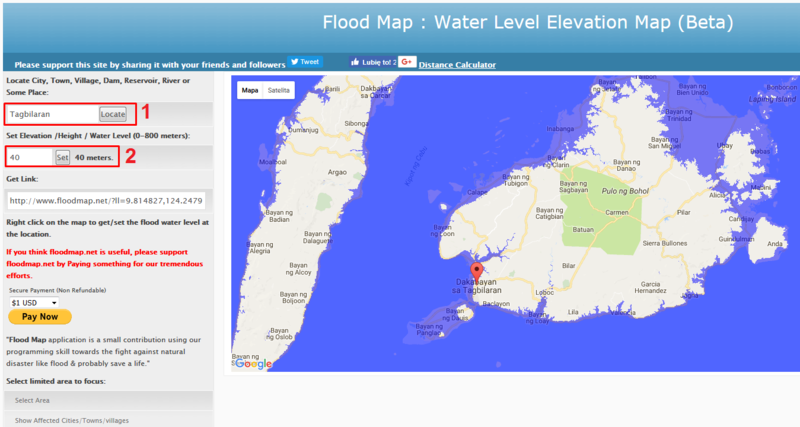 Finally I came to conclusion, that in spite of well-built sea level generator in Heywhatsthat.com, much better is use the Floodmap.net Water Level Elevation Map, because the data is more reliable. Let’s go to the next step: find the map with acommodation. You can do it on Booking.com when open the map option. The same step you can do in Airbnb and any other acommodation website (Pic. 9,10). Our last step is combining both sea level and acommodation map in the GIMP software. Open the GIMP and select File -> Open as layers -> the graph, that you have saved from the aforementioned websites before (Pic. 11). Pic. 11 GIMP – “Open as a layer” option. Do it twice, because you need two layers to make your map ready (Pic. 12). Each layer should be visible in your “Layer – Brushes” dockable dialogue (Pic. 12). Pic. 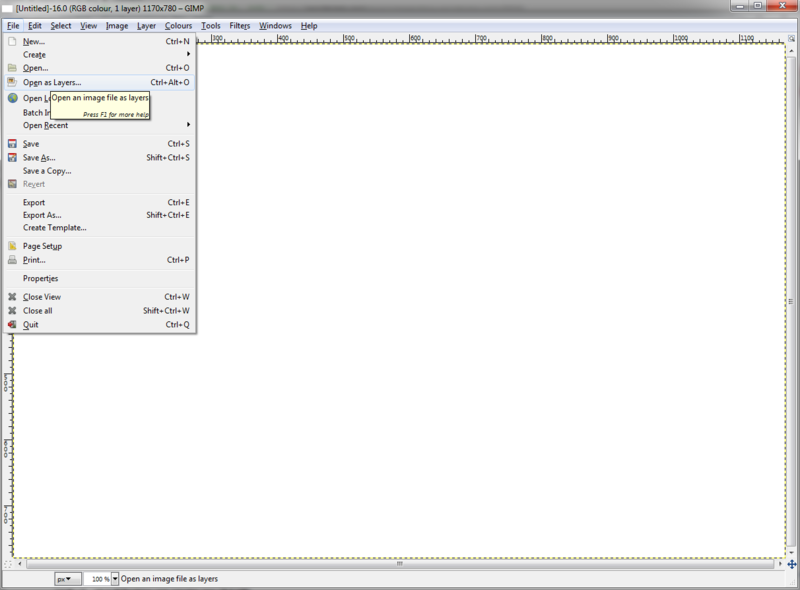 12 Gimp – 2 layers available when opened. The layers are in order, that they have been opened. You can select layer, that you would like to edit, marked in blue belt (Pic. 12). Our next step is make one of the layers transparent enough to see both layers at once. For this matter we should open: Layer->Transparency->Add Alpha Channel -> Colour to Alpha (Pic. 13). Pic. 13 Making the layer transparent in the GIMP software. Once you encounter this step you should have both layers visible (Pic. 14). At the finish you have to make them in the same position (Pic. 15). Both maps has been zoomed in on the same level, but their size are slightly different. Eventually you should get a nice map of tourist acommodation with the tsunami vulnerability. Pic. 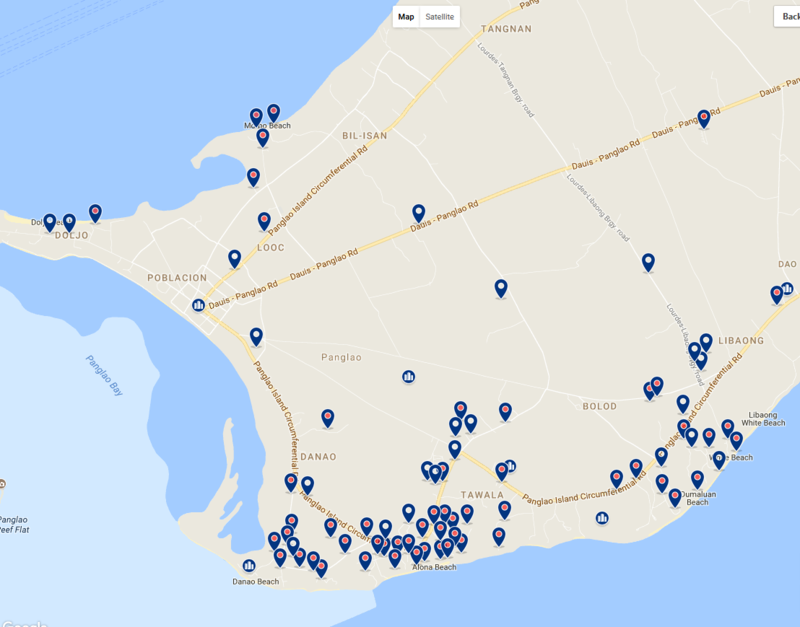 15 Degree of tourist infrastructure in western Panglao island with the tsunami vulnerability. The map above is the most reliable, that I could prepare for you unlike to map created by Heywhatsthat.com, where situation looks different (Pic. 16). Pic. 16 The sea level map provided by Heywhatsthat.com shows completely different tsunami estimation despite the local terrain details . At the summary I would like to say, that this is very simple process to create the tsunami vulnerability map for your tourist destination. 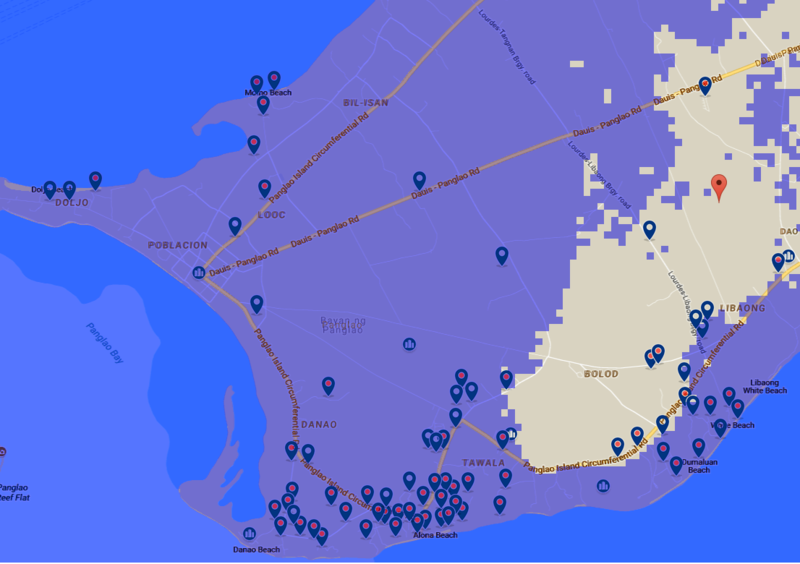 In general you can use the sea level rise maps for many purposes. This article also shows the inconsistency between those web tools. It was found, that not all sea level generators are reliable and checking the altitude of local area is required to make sure which sea level generator is more reliable. You cannon expect a very detailed map, although I think, that this kind of opensource GIS software works great in this case. Bryant, E., 2014, Tsunami: The underrated hazard, Praxis, International University of Malays-Wales, Kuala Lumpur. Bryant E., 2005, Natural Hazards, 2nd ed, Cambridge University Press, Cambridge.